A desperate need to make sense of the world occupies a young boy in provincial England, and we watch as his future shifts in ways out of his control while he navigates his third year at secondary school. If there is one area of writing where David Mitchell excels, it’s voices. In two or three sentences, he can make a character crawl out from the book pages and say, “Hello, I’m several people from across your life unified in one person. Remember me?” It’s almost eerie how fast he can make a character feel complex and interesting. There’s a fine line when writing about teenagers, as trying to capture the self-centred nature inherent to most can be irritating to older readers, but if you go too far the other way the characters feel almost inhuman, like they’re lifeless cypher a being used by the author to make a point about their own childhood. The main character here has a naivety which is relatable, but never crosses into frustrating. That is just hard to pull off. Mitchell is great at understanding the unspoken rules of teenage boys, the way word-choices, nicknames, and even the place you sit on the bus can act as a way the rest of the world can use to judge you, place you. 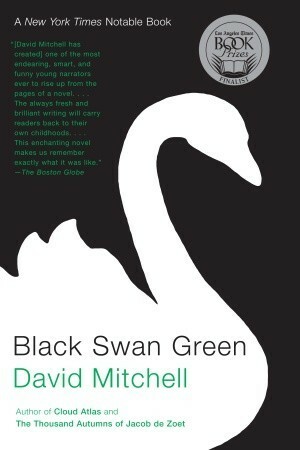 Black Swan Green captures the claustrophobia inherent to adolescence, the constriction many feel every time the uncomfortable realities of adult life creep closer towards them. He understands but never glorifies youth. He accepts that growing up can be extraordinarily painful and boring, but it can change you in ways you would never give up for the world. Love this book. Thanks for sharing! Thanks, I’m excited to read this now! I’ve got it ready to go at home. Great, good to hear! I get the feeling I’ll be re-reading this sometime relatively soon. Mitchell is becoming an addiction.